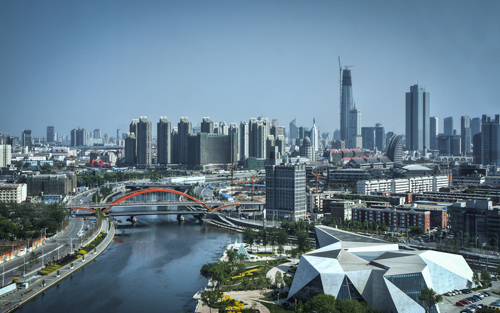 New York Times foreign affairs columnist Thomas Friedman was in Tianjin earlier this month for the 2010 Summer Davos World Economic Forum. His trip yielded a pair of opinion pieces blasting America for its lagging economic progress in comparison to rising China. I saw this skit myself on the local English-language TV station here, CCTV News, and though it was contrived, the point is well-taken. China sees this moment as a chance to pull ahead- which it is doing at alarming speed. Back in the U.S., rising groups like the Tea Party continue to futilely bicker about ‘lower taxes’ while ignoring the global forces at work undermining American economic strength. Friedman’s second piece, Their Moon Shot and Ours, is perhaps more alarming as he spells out the sectors where China is taking the lead in innovation. Up until now, China has always been a place where ‘cheap things are made’. America could always count on being the innovator while China continued being the low-cost manufacturing giant devoid of creativity. You don’t even need to read the rest of the piece to get the idea. If this isn’t a wake up call to the American people then I have no idea what else could be. With all the praise Friedman has given China recently, some have criticized him for being an ‘apologist for communism/repressive regimes’. If one thinks that lifting millions of people out of poverty and creating new jobs in innovative sectors for the 21st Century is repressive then I would have to respectfully disagree. The most repressive thing any government can do is not create opportunity for its citizens. Unfortunately, the U.S. is doing just that. The New York Times: Too Many Hamburgers?